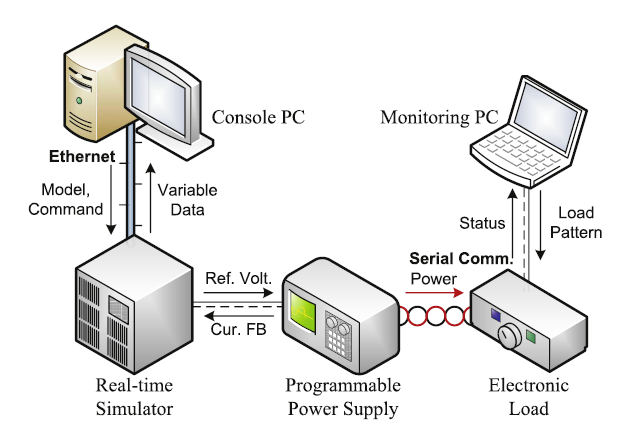 Power hardware-in-the-loop simulation (PHILS) has been introduced to its rapid prototyping and accurate testing under various load and interface conditions for power electronics applications. Real-time simulation with advancements in computing technologies can effectively support the PHILS to improve the computation speed of complex target systems converted to electrical and mathematical models. In this paper, advancements of optimized model constructions for a single crystalline photovoltaic (PV) panel are built up for the PHILS with a real-time simulator in the view points of improving dynamic model accuracy and boosting the computation speed. The dynamic model accuracy is one of significant performance factors of the PHILS which should show the dynamic performance of the simulation model during elaborate emulations of the power hardware. In addition, several considerations for the PHILS system such as system configuration and communication are provided to electrically emulate the PV panel with power hardware interfaces. The effectiveness of the proposed PHILS developed on Opal RT’s RT-Lab real-time engineering simulator based on Matlab/Simulink is experimentally verified using a prototype PHILS system. Effective Test Bed of 380 V DC Di..